We understand that for some motorhomers a 150 mile drive across Italy would merely count as a relaxing morning, but for those of us who travel in life’s slower lane it felt like one big, mad dash on Friday 18th February. The torrential rain didn’t help and it certainly lessened our appreciation of the landscape we drove through, which was largely rolling hills with massive fields from Matera to Potenza, where a great deal of Italy’s famous durum wheat is grown, after which the hills gave way to rocky ravines and gorges as we crossed the Apennines. We arrived in Pompei (note – after much discussion we are using the Italian name Pompei for the modern town, and we’ve retained the Latin, Pompeii, for the ruins) around 1 p.m. and drove around looking for the hotel where Rob’s sister and family were going to be staying - meeting family being the reason for our trip right across Italy’s ankle. We noticed a 24 hour secure parking site next to the station and a stone’s throw from the hotel, so that became our camping base for the next few days. Trust us to choose a place with no water, toilets or electricity, despite Pompei having many choices for motorhomes. Still, we needed few facilities for our weekend with the family, and the convenient location outweighed the simplicity on offer, and moreover cost us only €25 for the three nights. Pompei - our overnight spot in the carpark, and Piazza Bartolo Longo in the town centre. Elizabeth, John and their teenaged children Robbie and Frankie had come out to meet us for the second time on our trip (the last visit was in Helsinki in August). We chose Pompei as the venue because (a) there is ample accommodation both in hotels and for motorhomers, (b) it is near Naples airport and easily accessible from London, and (c) there is a lot to see and do in the vicinity. We spent Friday afternoon in a restaurant eating pizzas and pasta dishes and catching up with the news of the last 6 months, but the pouring rain kept us off the streets for the rest of the day. On Saturday we visited Naples on the train, and walked first through the magnificent teeming narrow streets of the centro storico, the mediaeval old town. We finished the outing with a ride on a funicular up to a hilltop vantage point in the smart suburb of Vómero, from where we could see the whole of Naples and the bay around to the towering bulk of Mount Vesuvius. 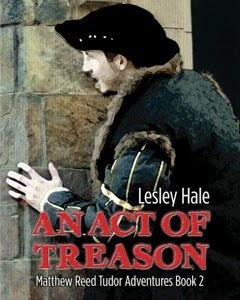 Lesley and I have been to Naples before and love it. If you like your cities big, crowded, bustling and hustly, where tight-packed mediaeval streets abut elegant squares and traffic-choked thoroughfares, and a touch of squalor coexists with a large dose of style and flashes of luxury, then Naples is for you. It was Elizabeth and John’s first visit, but I like to think that they got a glimpse of all these sides of the city. On Sunday they went to see the famous Pompeii ruins, but we have seen them before, and opted to stay around the town, where other interesting things were going on. The town of Pompei is renowned world-wide for the remains of a complete Roman town that was buried by volcanic ash and lava from an eruption of Vesuvius in 79 a.d., and that has been gradually excavated over the last three centuries. What is less well-known (and was unknown to us) is that modern Pompei is also the site of an important Catholic pilgrimage centre based around the huge basilica of the Madonna of the Rosary of Pompei which sits on the main square, and around which the town was effectively built at the end of the 19th century. It is the work of one Bartolo Longo, who seems to have quit mainstream Christianity for ‘spiritualism’ whilst at Brindisi university in the 1850s, had some kind of crisis in his late 20s, and spent the rest of his life trying to atone for this time by founding a church and various religious and educational institutions, which still dominate the centre of the modern town. Life revolves around Piazza Bartolo Longo, and we sat at a café watching the crowds spill into and out of the basilica in time with the frequent Sunday services. We noticed that there were many children in very elaborate fancy dress about, often no more than toddlers who were helped or dragged across the piazza by proud parents. The ritual evidently required that when children met others in fancy dress, they threw handfuls of confetti at each other, and we could see these flurries of coloured paper errupting around the square. We learnt that this is a Carneval custom, but in years like this with a late Easter the children clearly can’t wait the remaining two weeks until the official start of Carneval. On Monday 21st February we said our goodbyes to the family, all too aware that it will not be very long until we are back in Britain again, and headed out of Pompei towards Erculano – site of the ruins of ancient Herculaneum - along traffic-jammed roads, prompting us to splash out €2 for a brief spin on the motorway. We had an idea that we could have a picnic lunch by the coast, Herculaneum was a port after all, but the whole area was just too built up with virtually no access to the waterfront. At nearby Portici we found by accident the ‘Golden Mile’, a stretch of suburban road lined with splendid villas, which date from the 1700s to 1800s and are a legacy of the Bourbon aristocracy and fashionable Neopolitan society of that era. Herculaneum was absolutely fantastic. It’s a compact site, making it a lot more manageable than Pompeii, and the nature of its destruction, being buried under a layer of hot ash and then slower layers of space-filling lava, meant that the buildings survived to a greater height and with their contents preserved or carbonised in situ. The downside of these excavations is that they are under 20m of lava, so were largely given up when Pompeii, under a mere 4m, proved easier to expose. The result is that only about one quarter of the place has been excavated and the rest lies under the modern town, which was renamed Erculano in honour of its ancient forebear as late as 1969. 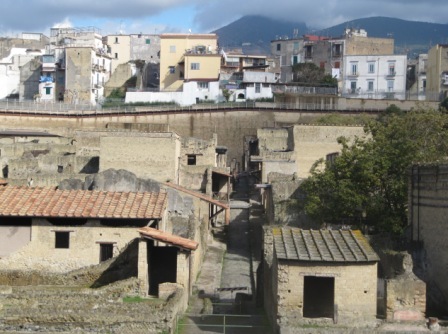 What you do get from Herculaneum is a great idea of the richer villas of the wealthy Roman port town, and the shops, taverns, public baths etc. The carbonised wood which remains in place gives a clear view of how internal screens separated rooms, how upper storeys and mezanines were used, how amphora were stored on shelves, and even of furniture such as beds and cupboards. Many of the villas still have mosaic floors and wall frescoes which are surprisingly intact and brightly coloured, but an awful lot was stripped out by the 18th and 19th century archaeologists whose ideas about how to excavate were very different to current ones. If you get a chance to visit Naples Archaeological Museum you can see some of the amazing artefacts found in both Herculaneum and Pompeii and it is well worth making time for a trip there. It took us 4 hours to amble around Herculaneum, and I’m pretty sure we didn’t see it all. It took the several British school trips a lot less time, but I’m not quite sure what they were getting out of their half term visit. It looked like my idea of hell! After the ruins we had planned to go to a camper stop we’d found at Portici, but instead decided to head up Vesuvius to see the lights come on over the Bay of Naples, as you do, and found an empty car park. What a choice – spend €15 and get electricity, water and waste disposal or sleep in an empty car park with no frills attached? It was no competition and we settled down to an evening of wondeful views half way up yet another mountain, whoops, sorry, volcano! It was a 5 minute drive next morning up to the upper car park on Vesuvius, where the coaches disgorge tour parties for the last short but steep (in gradient and price!) walk up to the rim of the volcano. I (Rob) paid my €8 and set off past shuffling groups of Italian, British, French and American teenagers on school trips. It was my first volcano, and worth every euro cent. The crater drops away sheer on one side of the path – its bottom far below is covered by mud and rock slides and fairly unremarkable, but the eye is drawn to the little whiffs of steam emerging from points high up on the rocky sides, almost reaching the rim where we stood and gawped. It was also priceless for the almost endless views across the Bay of Naples, from the city to Sorrento, and the islands from Ischia to Cápri, although Pompei was hard to spot in the slight haze that enveloped the coastal plains. The terrain up around the volcano’s summit was bare, with gnarled-looking rocks and a surface of grassless brown shale. There is so much to see around the Bay of Naples that you have to pick out highlights, and leave other things for another time – for example we still haven’t made it to Sorrento – but for now we decided to head for another volcanic curiosity on the other side of the city. The Solfatara crater is situated in Pozzuoli, around 10km west of Naples, and so we set off to drive there, taking the most direct and interesting route, that is, right along the Naples seafront. If you are going to drive in a large Italian city, try to do it between 1 and 4 p.m. These times mark the siesta, and although the streets may not be empty, it is then that you have the best chance of keeping moving, and your patience and nerves should be less stretched than at other times. Rob has an ability to adapt to chaotic traffic conditions rather well, and it was around the streets of Naples that he went native, weaving in and out, pushing his way into gaps and mouthing at cars “yeah mate, I’m bigger than you”. Luckily he didn’t go the whole hog, which would have involved holding a mobile phone to his ear with one hand, dangling a fag out of the window with the other, while overtaking on a solid white centre line in the face of oncoming traffic. It has to be said that Italian drivers, especially around Naples, have to be the worst we’ve come across on our trip so far. I wouldn’t be surprised if there are special sections of their driving test which fail you on things like cowardice in the face of a juggernaut, or inability to take a hairpin bend while continuing your important phone call. The eastern and western suburbs of Naples are quite different. Our drive began at Portici in the eastern suburbs, where the Bourbon villas soon give way to a very gritty urban landscape with narrower roads and traffic bumping over cobbles and broken surfaces. The west is the smart side, and chic apartments overlook the landscaped seafront in the suburbs of Chiaia and Mergellina. At Posillipo the road climbs a cliff with panoramic views back over the city to Vesuvius, and we noticed a number of South Asian and Filipino maids collecting neat Italian children from school here. There are exceptions – the bay at Bagnoli is occupied by the hulking skeleton of an abandoned steelworks – but Pozzuoli is essentially an extension of the comfortable western suburbs, a pleasant-enough, traffic-clogged town with a number of large Roman ruins scattered among its streets. We went first to the Solfatara Volcano Campsite, adjacent to the crater. They wanted €24.50 for one night’s stay, and as this is more than any night on our trip to date we (or specifically Rob) rather sulkily refused and we drove off in search of a more economical night. Had we known that this included entrance to the crater itself things may have been different, but we only found that out two days later. After a little driving around more semi-urban areas in the dusk, we found the little harbour at Baia, further round the bay and even more dominated by Roman ruins, and had a quiet and comfortable night in the quayside carpark for an outlay of €3. Basing ourselves now on this side of Naples, we took another train into the city on Wednesday 23rd February, leaving Charlie safely in the van in a supervised private carpark in Pozzuoli. That’s another thing we should have mentioned about driving in Naples, and other large cities – parking can work out very expensive, as nowhere is free and the going rate is a minimum €1 an hour, or more if you want to park right outside the best shops/restaurants/seafront promenades. A few supervised carparks exist, and may offer daily deals of €8 to €10. All this presupposes that you can even find a free parking space, which before 1 p.m. may be no easy matter. Naples museum – statues from Pompeii. Our destination on this day was Naples’ National Archaeological Museum. Herculaneum and Pompeii are impressive sites, but you see just walls and floors there, and it dawned on us that most of the artefacts found had been removed to museums. It’s not the most imaginatively organised or well labelled museum, but there’s enough information in English to inform you about the collections and some of them speak for themselves. We were particularly impressed with the mosaics, which were amazing in their intricacy, using thousands of tiny tesserae following the contours of shapes in the way a painter uses brush strokes. Their colours, after nearly two thousand years, are bright and clear, and the pictures are so much more accomplished than, say, the work of a certain Norman monk in Otranto (see Italy 1 blog). Seeing these mosaics, plus the statuary and artefacts from daily life, gave us a much better idea of what these two Roman towns and the insides of their villas would have looked like. Then there was the ‘Secret Gallery’, which is kept locked when unattended and only open to adults, and contains a side of Roman culture which is entirely at odds with modern ideas, such as hanging up large bronze phalluses with bells on outside houses to ward off bad luck. Naples museum – mosaics from Pompeii and Herculaneum. Visiting Naples, and Italy in general, you can’t fail to notice the mouth-watering food on sale, in restaurants, street stalls and shops. Everyone knows about pizza, and the Neapolitans take theirs very seriously, but we also fell for the little snack-sized potato-based crochete, or their rice-based cousins the conical arancini that are sold outside many pizzerias. Food in Italy is an intensely regional affair, and you should not bank on finding the food of one region on sale in the next-door province a few kilometres away. In Puglia for example every shop sells tons of little ear-shaped orecchiette pasta, but you will not find them in Naples, which conversely has its own favourites like buffalo mozzarella and several kinds of fried pizzas (in addition to the usual baked ones). It is a country above all of small shops, food and otherwise, and the butchers and bakers, greengrocers and cheesemakers display a pride in their produce that cannot be reproduced in a supermarket with the size and charm of an airport terminal. The international goliaths are appearing on the scene in the shape of French chains like Carrefour, with a few Lidls and home-grown cheapies, but the most fun shopping still involves touring little village-like shops in even the biggest towns. After our trip to Naples and the museum we returned to Pozzuoli by bus, which proved a good, if slow, way to see a little bit more of the city. We reached the secure parking at about 7:45 p.m., aware that it had been a long day for Charlie dog. Everything inside the van seemed fine though, until we discovered an empty litre carton of UHT milk and knew we hadn’t left one in the bin. Unfortunately, little doggie paws can’t manipulate tetra packs very well. He was obviously able to rip the thing open, but failed to keep it upright while he drank the contents. The wet carpet at the back of the van, and the seepage under the back storage unit and onto the bedding was testament to this. On Thursday 24th February we visited the Solfatara crater on the edge of Pozzuoli, and realised that if we’d stayed on their campsite we could have visited the place for free and had it all to ourselves all evening. It was a very strange landscape with a flat, white bottom, and rocky sides covered in sparse vegetation, where jets of steam emerge out of tiny holes in the ground at high pressure. Lower down you can stand next to these steam holes, or fumeroles, to hear the immense rushing of the vapour and feel the incredible heat – up to 160°C. The smell of sulphur stayed with us all day, reminding us of the way our waste tank smelt all those months ago in Germany, before we learnt the trick of not putting everything down the plug hole. In the very centre of the flat area was a pool of hot mud. It was actually bubbling and is said to have excellent curative value for all manner of complaints, from rheumatism to acne. The very air around the crater is actually meant to be a ‘pick you up’ of the Viagra type – can’t say we noticed the effect! 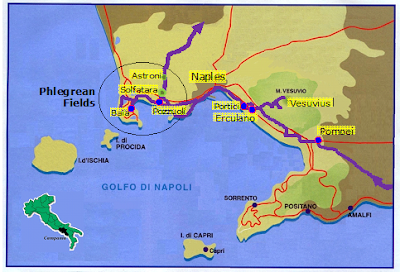 This area to the west of Naples has been known since Roman times as the Phlegrean Fields – Campi Flegrei in Italian – and is marked by dozens of extinct volcanic craters which form a landscape of steep escarpments surrounding dead-flat basins. Traces of volcanic activity remain in the form of hot springs and gasses at several locations, and although none match Solfatara for impressiveness, there are a number of thermal spas around. It was also rather a playground for the rich and powerful of ancient Rome, and many large complexes of ruined palaces, baths and amphitheatres dot the landscape, along with a submerged port near Baia that was once an important Roman naval base. 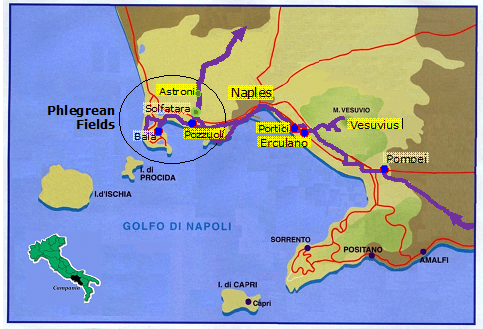 Today however you are never far from Naples’ urban sprawl, and much of the Phlegrean Fields is more semi-urban than rural. On our way out of the Naples area, we went looking for the Astroni crater which is a nature reserve, but found it closed to visitors, although we were able to picnic watching horses exercising on a racecourse on another crater floor far below. Then we drove on through the last of the suburban sprawl and headed back towards the Apennine mountains.